Rugby Union owes a massive debt to the Pacific Islands. There’s something about these tiny nations that seems to churn out world class rugby players at an unbelievable rate. And it’s a talent pool that the rest of the rugby world has benefitted from, with players of Island descent representing practically every top test nation in the world to varying degrees. The politics of this is awkward and prickly to say the least, but at a bare minimum you have to admit that for the contribution the Pacific Isles have made to global rugby, the fact that tier one test nations rarely visit to play games there seems more than a little unfair. Thankfully, that’s about to change. As part of their Rugby Championship warm up, the mighty All Blacks will take on Manu Samoa in Apia on 8 July, the first time in the World Champions’ history that they’ll play a full test match on Samoan soil. As we’ve mentioned previously, Samoan rugby has been in turmoil off the field in the last year or so, but there’s real hope this historic moment will mark a turning point in Manu Samoa’s fortunes, and will kick off a trend of Tier 1 nations visiting the Islands on a regular basis, and giving back to a region that has contributed so much to the game. But enough of the background, there’s no better way to mark a special rugby occasion than with an equally special shirt, of course – we all know this, it’s a fact – and BLK have produced a particularly striking example. 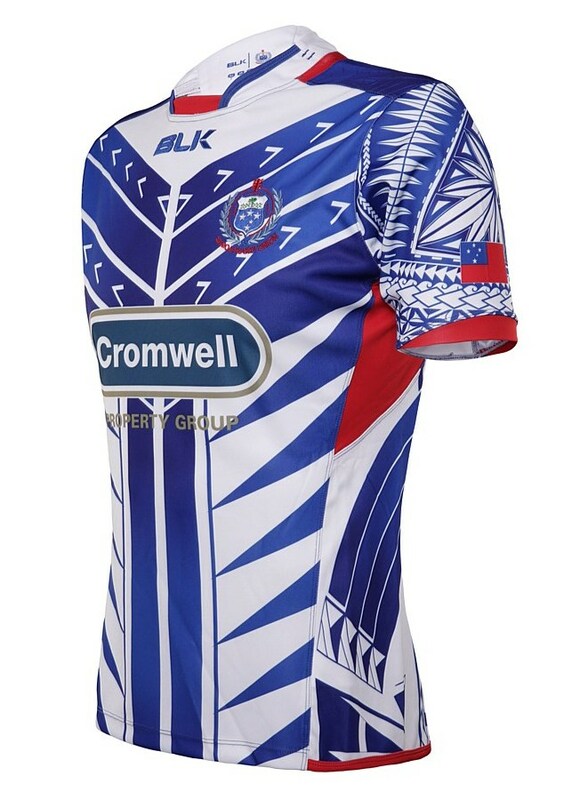 Keen-eyed readers will have noticed that this shirt actually sports the same basic design as Samoa’s World Cup shirt, but as with the alternate design this year, clever use of colours on the design makes it feel a whole lot different. It’s almost like a fusion of the two World Cup shirts really, there’s a lot of blue, from the home shirt, combined with white accents from the alternate. 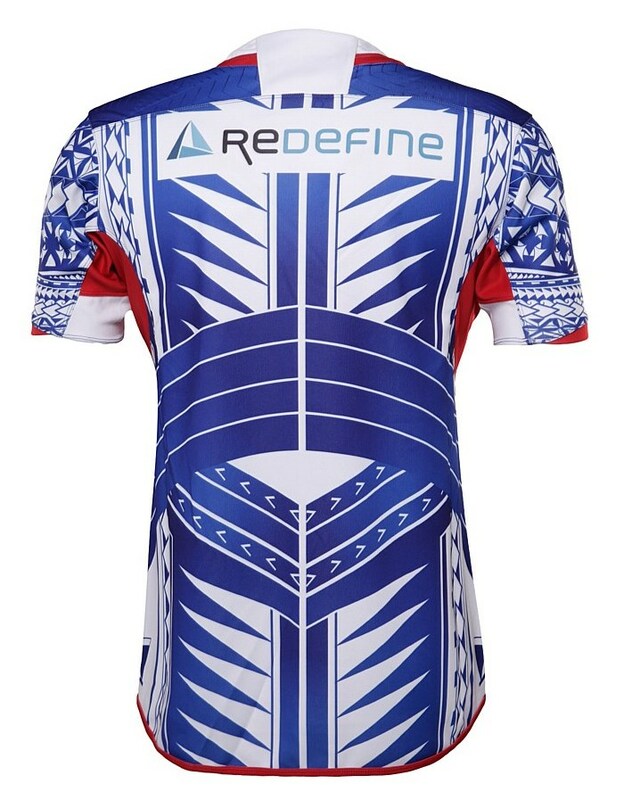 Whereas the RWC shirts used colours in an understated way to accentuate different parts of the intricate traditional Samoan patterns, here it’s been turned right up to 11, and accentuated everything! It’s a truly jaw-dropping bit of shirt design when every inch of the incredibly detailed and complex design is highlighted like this, and while we think this might be a little too much for a regular tournament shirt, as a shirt for an historic occasion goes, it ticks all the boxes. It’s bold, memorable, and is a design that emphasises Samoa’s long and proud history, too. There’s no more appropriate team to visit Samoa than the All Blacks – from Alan Solomon to Michael Jones, Tana Umaga, Ma’a Nonu and Sonny Bill Williams, players of Samoan descent have been a massive part of New Zealand rugby’s success for decades. The Apia test is a first step in showing the gratitude New Zealand and the rugby world in general should feel to Samoa and the rest of the Pacific Islands for their contribution to rugby, and this striking jersey is a great way to mark the occasion. We hope this is the first chapter in something great for rugby union in the region. 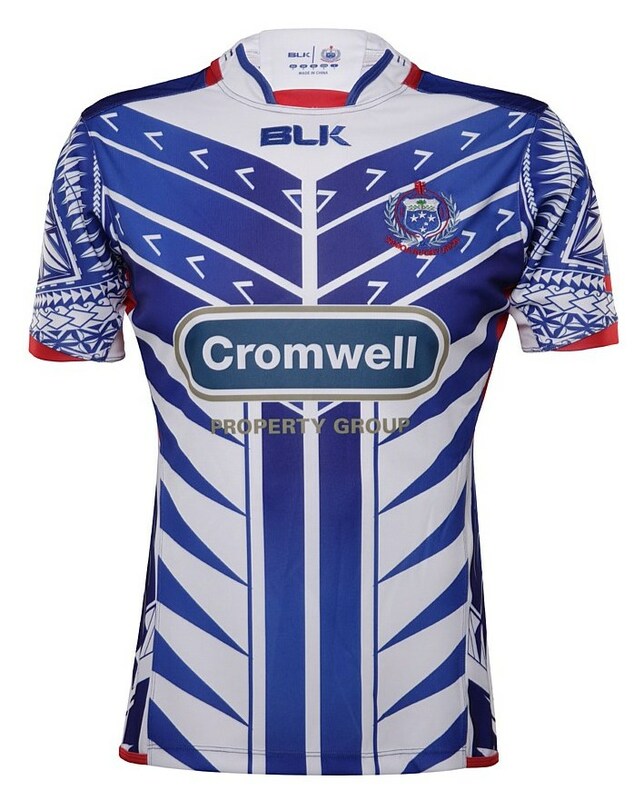 How can I buy the New Manu Samoa newest jersey the one that they wear when they play all black ?? Hi, do you know if the 2019 world cup jersey for manu samoa released yet?